This week is going to be a firecracker, as the Sun, Mars, Venus cluster around unpredictable Uranus in Aries, the touchpaper sign. The Moon is already involved with this, making a quincunx aspect to that pack of planets shortly, which creates a Yod with Saturn in Scorpio. This is all happening around 8-11 degrees, so if you have any planets around there, you will feel this electrical energy. On the 27th, the Full Moon in Libra is fully ignited by the planets in Aries, setting relationships ablaze, or illuminating the truth about them. Since Mars and Venus, the lovers, are close too, this emphasises the relationship vibe. Chiron is also involved from Pisces, as is Jupiter in Gemini. Both in the crucial degree zone. Sparks are sure to fly. In the wider world, there could be some startling news. On a personal level, this is an opening for change, and with Jupiter and Venus both in good aspect, plus Saturn and Pluto also at an excellent angle to each other, there is the possibility of making practical, life-enhancing changes, even if they may be rather startling. I am offline until the beginning of April. Enjoy yourself and have a happy and exciting holiday. Hmm, I wonder about a Capricorn at 9°36’26, with Saturn & Aries at 6°06’2 and the North node in Aries. Will this Aries vibe provide some deep shifts in the relationship sector??? Capricorn 9-11 is where load of institutions and countries, including this one, have their Suns because it’s the 1st of January. 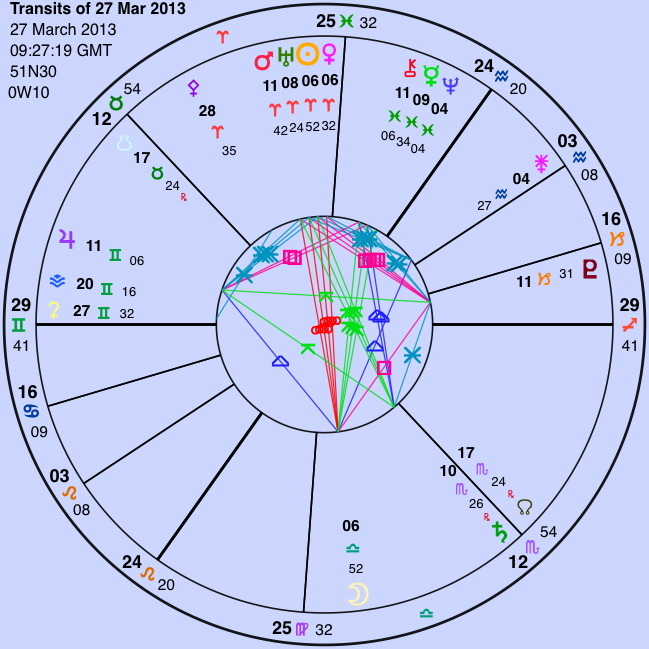 I’m having my Solar Return on March 27th, Sun 7 15 Aries and Mercury at 7 33 Aries + North Node at 7 55 Aries. Happy Easter and enjoy your holiday. Squaring my 11 Capricorn Saturn then. He already has Pluto squatting on him. Yuk.